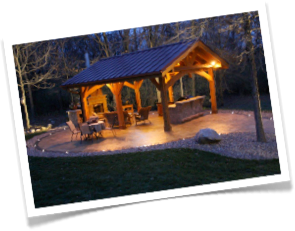 Wisconsin Pavilions is the clear contractor choice for one of a kind timber framed outdoor entertaining spaces. Wisconsin Pavilions is a fusion of two companies, Creative Landscapes Inc. and The Log Home Guy. This combination brings forth the best qualities of both a landscape contractor and timber frame and conventional construction contractor. We offer many unique packages designed by our in house experts. Many finish options are available that allow customers the ability to customize the space to their style. The integration of modern, energy saving, LED accent lighting and other features adds to the creation of a relaxing environment. Mosquito Curtains and Winter Curtains help keep out both biting insects, and biting cold, making this a true three seasons entertaining space. 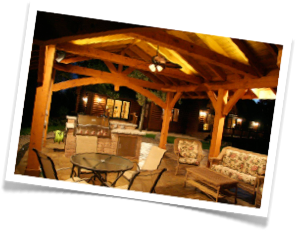 For the best in outdoor living spaces contact Wisconsin Pavilions today!